See that SCHERZINGEN crest (click here to see it bigger)? 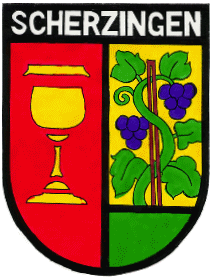 That's the official crest of the town of Scherzingen, Germany (current population about 80), where the Scherzinger family originated. It's a really tiny town that's actually smaller than most suburban subdivisions in the US. The crest was sent to my father, Earl, by his second cousin, Robert Carl Scherzinger, from California. Thanks, Robert! Please feel free to roam around. There's a lot to see here, including our old Geocities site. Although it is extremely outdated and should probably just go away, I've preserved the photos, but note that the information is very old. You can access the old sites via the Family Links menu item. Mayan Night was one of the evening entertainment shows during the week we visited. Unfortunately, the camera batteries died after I took this one shot and I didn't have my spare set. It's not even focused. The show lasted about 45 minutes. Bruce and Eileen savor their last sunset before heading for home at the end of a relaxing and memorable week at Cozumel Palace.